The first star of Sunday’s OHL game between the Erie Otters and the Niagara IceDogs was a goaltender who allowed 13 goals on 45 shots in a 13-4 loss. Of course, he was also wearing skates that were far too small, a jersey that had been hastily assembled just days before, and goalie pads the likes of which he hadn’t put on since he was 5 years old. Not to mention that, because of shoulder surgery, he hadn’t played in a single game — even at center, his typical position — all season long. Otters backup goaltender Devin Williams had been injured earlier in the weekend. Starter Ramis Sadikov was run by IceDogs forward Alex Friesen and could not continue. And so Connor Crisp, who had been designated the backup goalie by the team but hadn’t really thought twice about it, got the absurd tap on the shoulder. The skates he had to borrow hurt his feet so much that he looked like Bambi for a few initial minutes on the ice. Connor allowed 13 goals, but more importantly he stopped 32 shots, getting cheers from the Niagara crowd, who had an idea of what was going on. When the game ended he received first-star honors, a standing ovation, and personal congratulations from all the players on both teams. Crisp wasn’t the only backup goalie called into desperate duty this past week. The Tampa Bay Lightning, with injuries to Mathieu Garon, gave Dustin Tokarski his first start, though his 29-save performance still turned into a loss when Alex Ovechkin scored in overtime to give the Capitals the 3-2 win. Fun fact: Tokarski is nearly a full two decades younger than the Lightning’s other option in net, Dwayne Roloson. And for the Boston Bruins, the good news was that highly regarded backup Tuukka Rask only suffered a groin/abdominal strain in a game against the Islanders on Saturday — instead of reinjuring his knee, as many had feared. The bad news is that Tim Thomas is 38 years old, and not having a backup option for the four to six weeks that Rusk will be sidelined is not the best recipe for success going into the playoffs. (ESPN Boston’s Joe McDonald notes that “Thomas has always been at his best the more he plays,” but 17 games is still a lot.) Another Bruin goaltender, Anton Khudobin of the AHL, is currently injured as well, putting Boston in a bind. 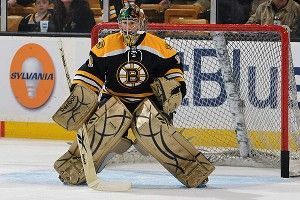 Enter Marty Turco, the 36-year-old NHL veteran, overseas player, and NHL Network analyst who was signed by the Bruins this week. Because the NHL Trade Deadline has passed, Turco is not playoff-eligible, but the hope is that he can provide a game here or there to give Thomas a rest. Turco played games in Austria this season; prior to that he, last appeared in the NHL in March 2011 with the Chicago Blackhawks. Because of CBA rules, Turco had to clear waivers after being signed by Boston, opening up the potential for another team to swoop in and grab him just to deny the Bruins the option. (He wouldn’t have been able to suit up for any team that did.) But I guess we’re not in a Mean Girl-era of the NHL right now, because no one resorted to those bitchy tactics. I kinda wish someone had. I wrote about Henrik Lundqvist‘s predilection for taking the puck off his forehead. The next day, John Tortorella was asked about his soccer-style moves in a post-skate press conference. “I can’t stand it,” he said. The front-runners for the William Jennings Trophy, an award given to the goaltenders on the team who allow the lowest number of goals on the season, are currently Brian Elliott and Jaroslav Halak of the St. Louis Blues. Halak has been so hot that the puck is now saving him.